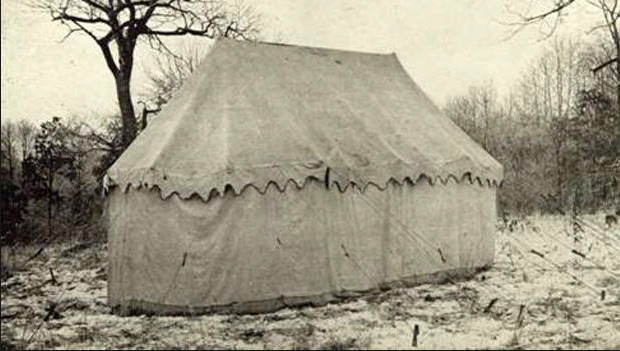 This image shows how the original tent appeared in Valley Forge in 1909. Philadelphia University textile design faculty have participated in the restoration of a linen canvas tent used by George Washington as his office and sleeping quarters during the Revolutionary War. The tent will be featured as a permanent installation at the Museum of the American Revolution, which will open in Philadelphia in spring 2017. Following the Revolutionary War, the tent was preserved by the family of Confederate General Robert E. Lee, whose daughter Mary Custis Lee sold the tent at the turn of the 20th century to Rev. W. Herbert Burk to be exhibited at what was then called the Valley Forge Museum of American History. The recent restoration project entailed using digital inkjet printing to reproduce as closely as possible new fabric that matched the original material. The new fabric swatches were then used to repair holes, rips and a large piece that had been cut away, said Wendelyn Anderson, technical associate for PhilaU’s Center for Excellence in Surface Imaging, who worked on the tent with noted textile conservator Virginia Whelan. The fabric swatches underwent color trials for authenticity. E.J. Herczyk, associate professor and drawing coordinator in PhilaU’s textile design program, also served as an adviser on the project. The restoration process involved using dye sublimation to digitally print the image on transfer paper and then transfer the design to the fabric with a heat press, Anderson said. 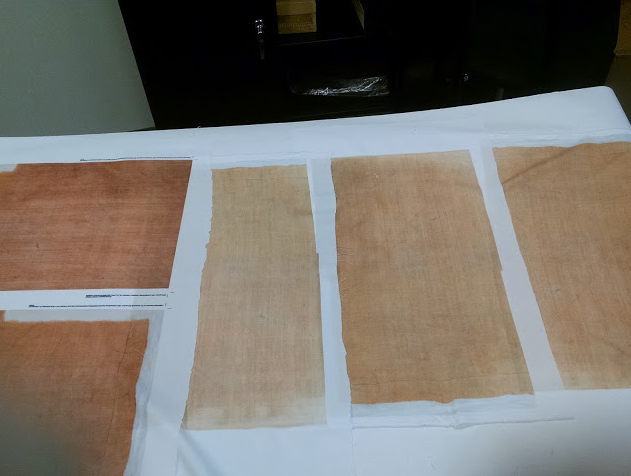 The matching process began with high-resolution digital photos of the fabric, which Anderson then manipulated in Photoshop, printed the samples and sent them to Whelan’s conservation lab in Valley Forge for review and further refinement. This trial-and-error process was done in two stages, first to match the scale and then the color.